Ready to attempt acrylic paint pouring? 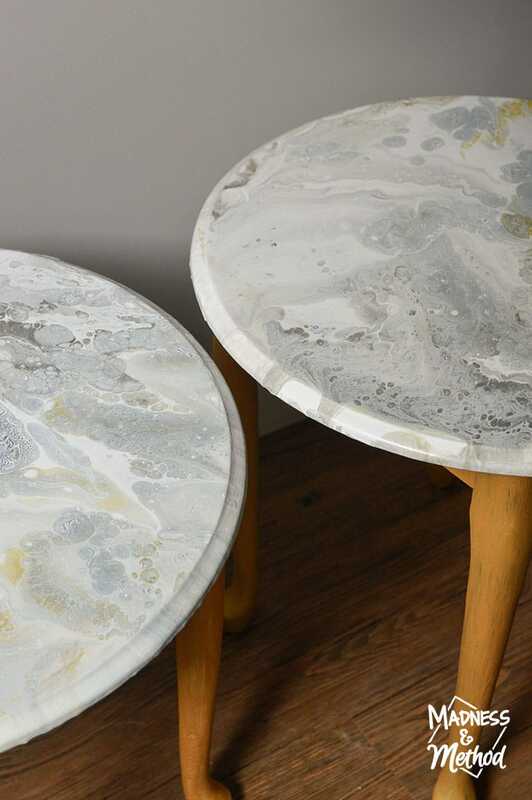 These marble pour nightstands are a great example and can be recreated with a just a few simple tips and products! 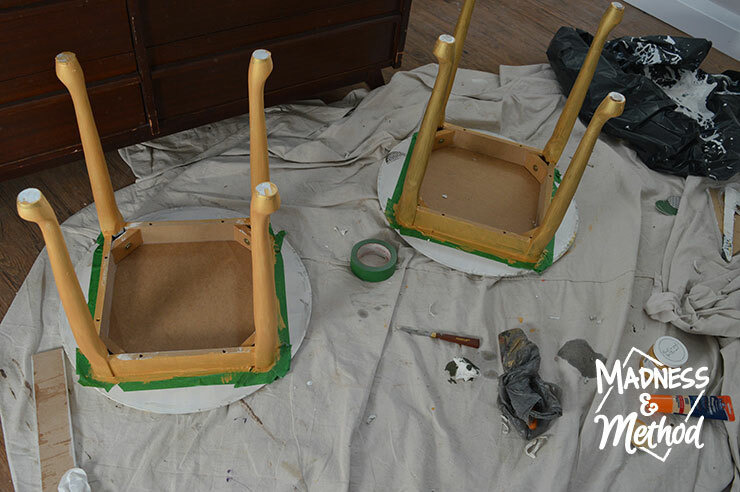 We’re coming to the halfway point of our six-week bedroom makeovers, and I’m slowly tackling all the projects so that we can finish on time. 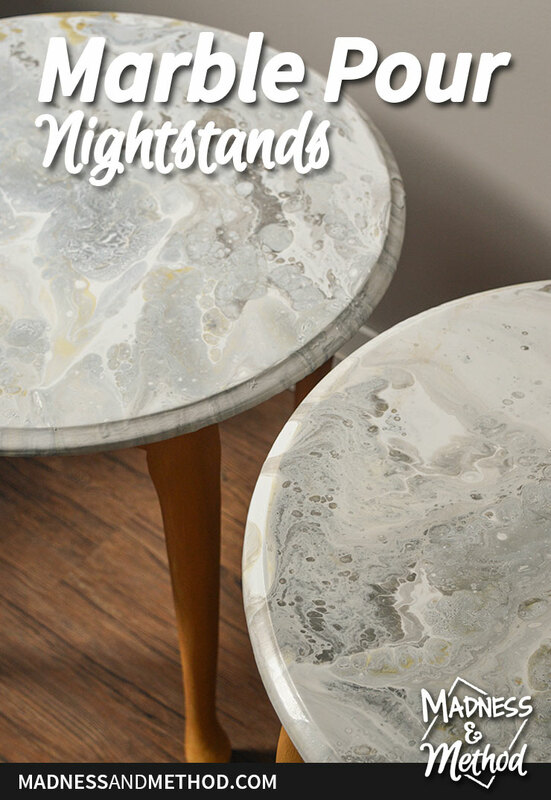 This week, I’ve got some marble pour nightstands to share… and have somewhat started on everything else. 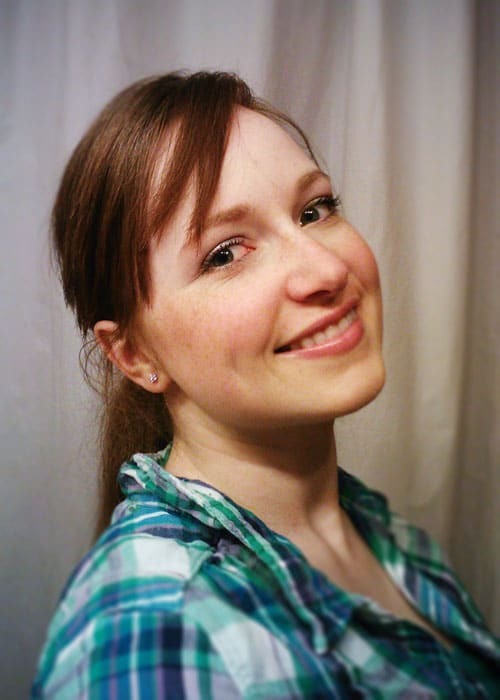 Let me show you the progress so far! 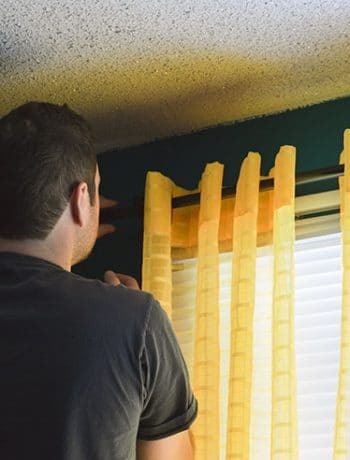 Just to recap, while we’re trying to finish ALL the rooms at our rental renovation, I decided to put special attention into the master bedroom for the Spring One Room Challenge. 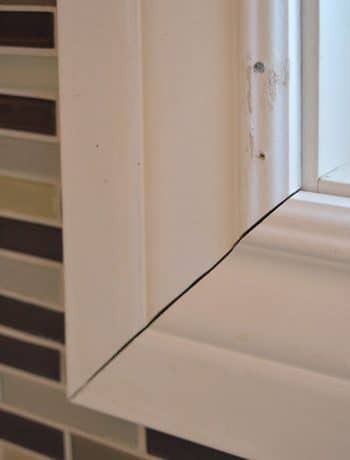 And, if that wasn’t hard enough, we’re also giving our main master bedroom a bit of a refresh for the challenge as well – so make sure to check out the design plans for both spaces in Week One. 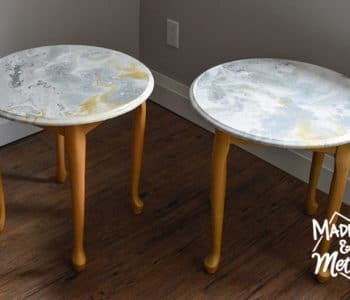 Last week I did a painted and stained dresser makeover for the bedroom at the rental, and this week I’m back in the same room with these marble paint pour nightstands! 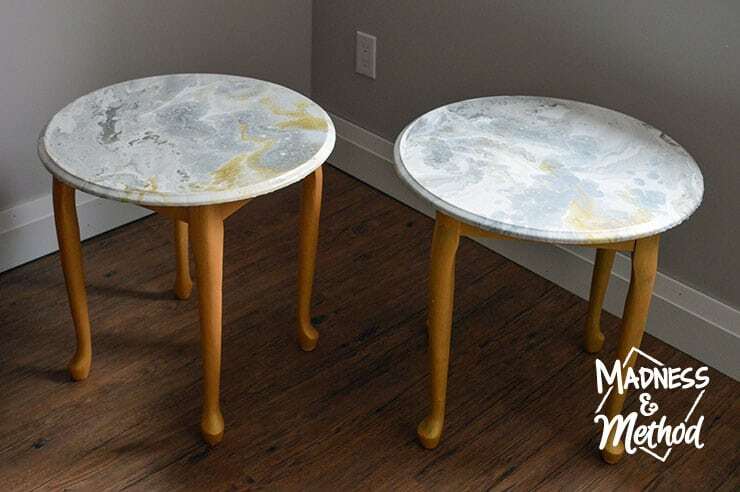 I had picked up two secondhand side tables that we’ve been using upstairs at the rental while we wait for the basement to be completed. Funny story, I actually bought them from two separate people but they matched so I had to do it! 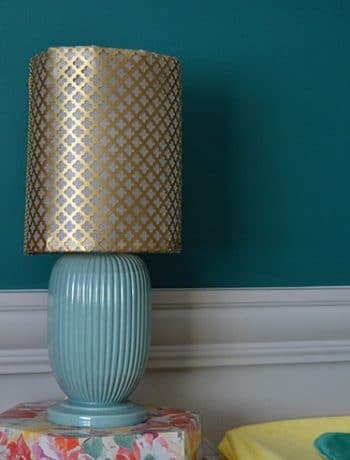 I knew I wanted to eventually give them a makeover (my original thought was yellow before I came up with the home’s colour scheme!) and was planning on taking off the weird non-useful hardware. There was also a bit of damage on one of the legs from the previous owner’s dog, so it was something else I wanted to patch up. 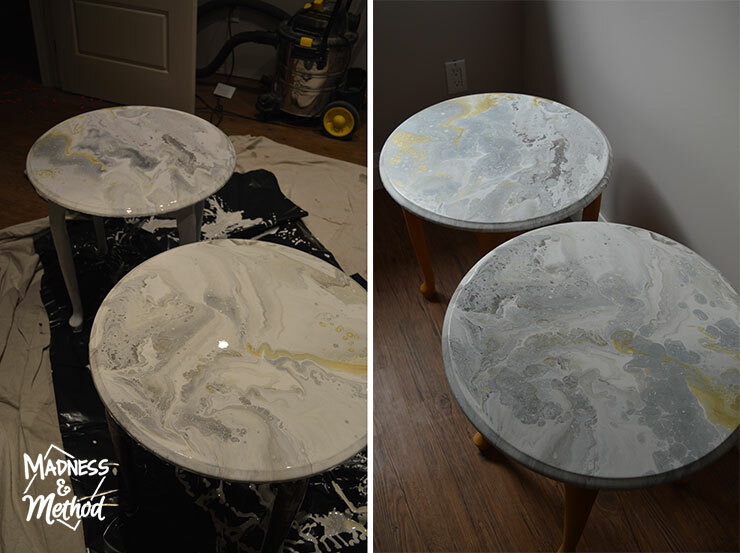 But then I did the marble paint pour for our dining table, and I knew I needed a bit of redemption after the failed-ish attempt. 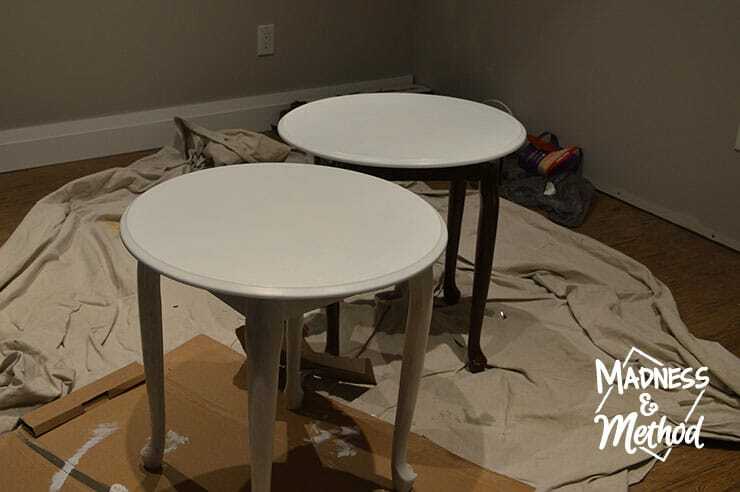 I already had these tables, so it was a no-brainer and a week or so ago I sanded them and painted the tops white to get a nice clean base. 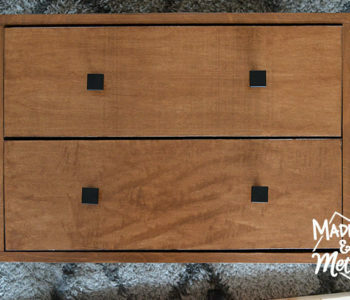 (Oh, and patched the hardware and dog chew marks!). In total, the actual paint pour itself doesn’t take that long (I think it was around 30-40 minutes for the setup, the pour, remixing and pouring again, wiping, and clean up!). The dry time seemed a bit longer this time (since the ratio was a bit more liquidy); but I waited a few days before I turned the tables over and gave the bases a few coats of gold paint. 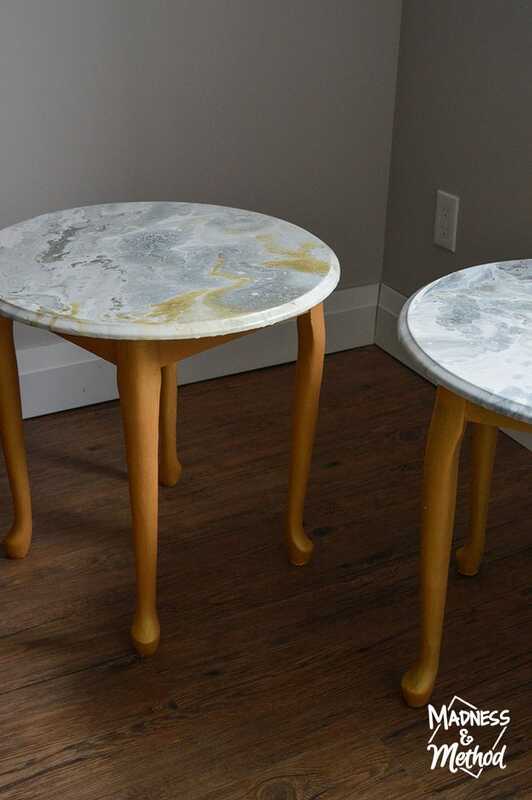 I had painted one white before and kept one the dark/wood colour; and the white legs will need fewer coats of the gold paint to fully cover them. For example, I felt like the gray came up a lot more while the paint dried. Or at least, maybe it just mixed in more compared to staying as separate as it was before? It’s not that I don’t like the grey as much, it’s just that I wish there was a teensier bit more white. 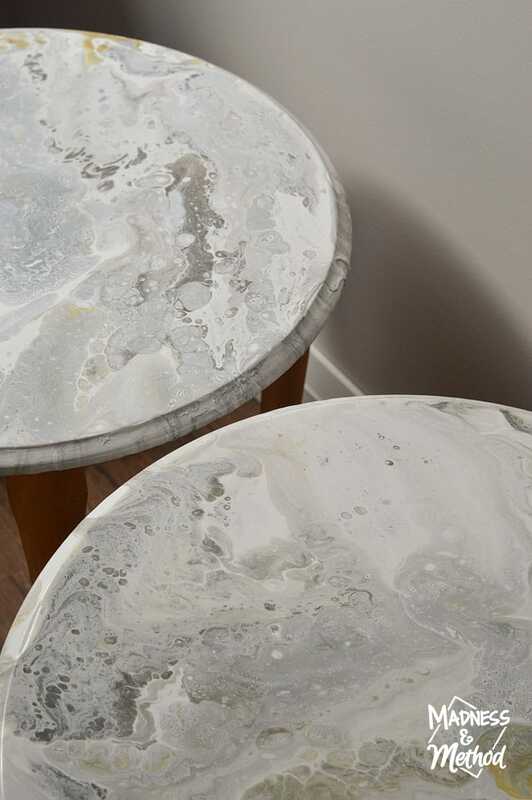 I even quickly thought about whitewashing them, but I don’t want the table lighter… just less grey, you know? I also found the look to be more galaxy-er than the first paint pour table I did. Kind of like the colours exploded together more – still very cool looking. 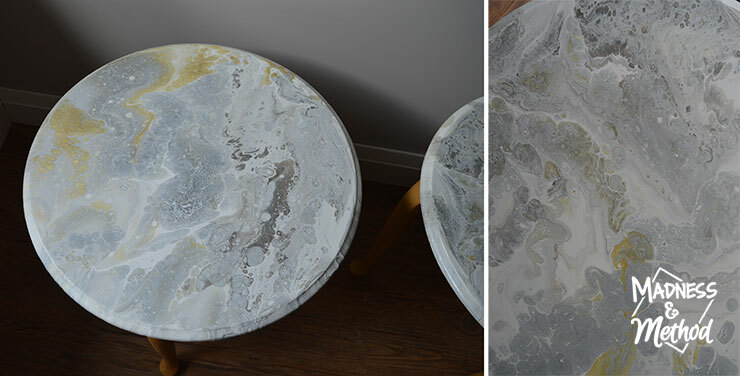 Either way, I really like the look of both nightstands, and I like that they’re both a bit different (I’m going to ask the Husband which one he’d prefer… but I know it’s probably going to be a big fat “I don’t care”, ha!). Compared to all the bit crazes and humongo drip areas I had on my first table, these just had a small area of drips (seriously, those are the only spots that it poured down too much!). 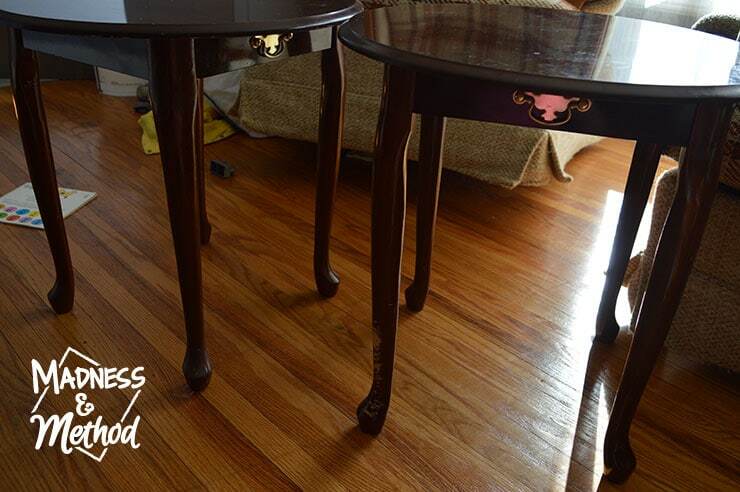 And, there was only one big craze/dip on one of the tables – so I’m calling that a big win! Which means that I’m going to skip the epoxy coating, and am hoping that a couple coats of polycrylic will be good enough (I still have to do that… and maybe one more coat of gold paint on the legs!). Because it’s Easter weekend in a few days (and we’re celebrating someone’s first birthday too!) we’ll be a bit busier with family stuff. BUT my parents will be down and that means I have extra babysitters AND project helpers (they love coming to visit me during One Room Challenge time, ha!). 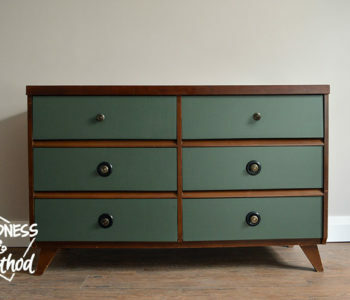 So I’m hoping I can devote a lot of my time to all the stuff in our main master bedroom since we’ll be there more… (finishing that room would be nice!). 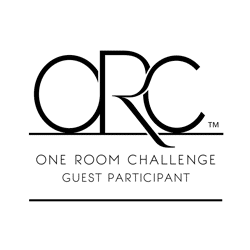 Make sure to check out the One Room Challenge website to see all the projects being completed this round! 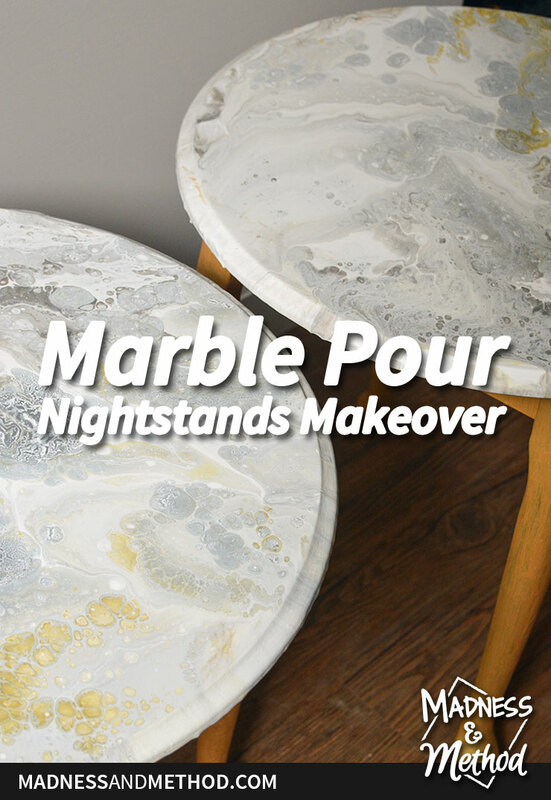 Feel free the Pin this marble pour nightstands project to Pinterest (and you can follow me there too!) to save it for later. 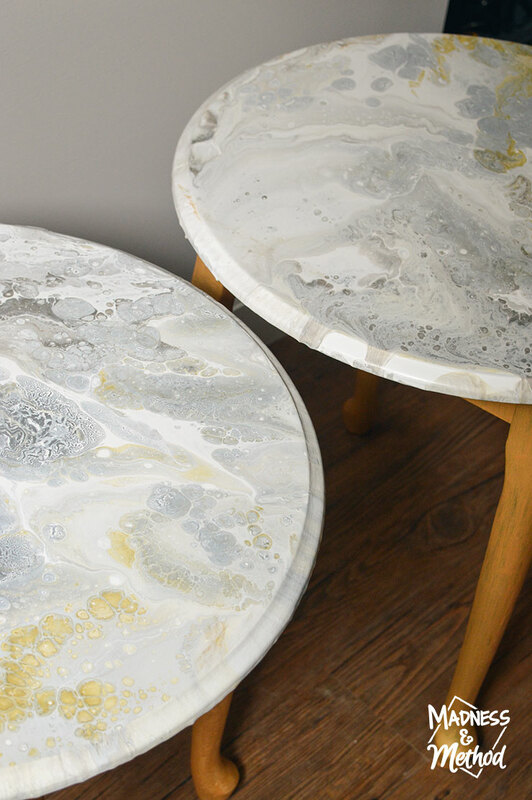 Since I now have two paint pours under my belt, I’m totally an expert… but you know, can only do marble-look round tables… ha!